This app was the featured idea in the daily email from the website Good.is – Redesigning City Streets with a Mobile Phone. While the app is being developed by a group from Austin, Texas – it could be a great tool for Pittsburgh. I think this is a really cool and easy way to engage people in improving their communities and is this app is worth a look. I really like this project and I’d recommend watching the Kickstarter video below – Jessica Lowry who created this app as a way to create safer, more walkable streets does a great job explain the project. 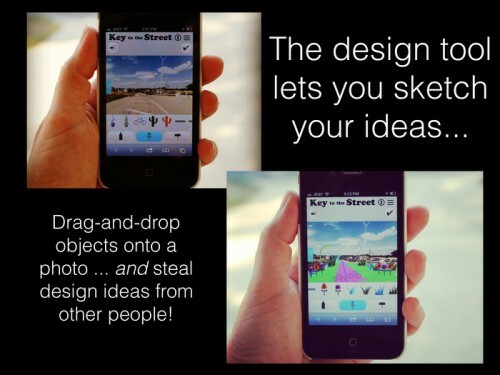 Key to the Street is an app that lets anyone add design ideas to a map from anywhere. Key to the Street lets anyone make suggestions on what would make your streets and sidewalks better. Think a corned needs a garbage can? You can add on right on to the streetview in your neighborhood and share it with others. As ideas are added the map, city planners are able to access the information and see exactly what residents would like to see in their neighborhoods. Key to the Street is still in development, but you can try the product demo here. Key to the Street has already won a number of awards and currently has a Kickstarter Project running to raise $10,000 to support the the building of the beta app. Check out the video and you can contirbute to Key to the Street on Kickstarter here.